Both of the methods are not robust, with obvious limitations. Using a Chrome tab to stream local media to Chromecast is the simplest method. But it is severely limited by the media formats that you can play through Chrome browser. Very often, the user has to install additional software or codecs to play certain media files. Sometimes, it is frustrating to figure out what you need to install so that Chrome browser can play the video. Another limitation of casting a Chrome browser tab is that it is hard to use a playlist in Chrome browser. But for most people, a large portion of local media files are short home videos. It is painful to play them one by one. For the second method (sharing the whole desktop) is still experimental. So, for some people, it works. For others, it may not work, or it does not work as expected, for example, a lot of Chromecast owners got problems in audio with this method if they want to stream local videos to Chromecast. Both methods of streaming are limited to 720p. So, I decided to find out some alternative methods that are more robust in streaming local media files to Chromecast. I also want to use a free solution only. The best solution I found is using Plex media server to stream local media to Chromecast, after about 2-month testing. Why streaming local media to Chromecast is not as easy as internet media streaming? Some Chromecast owners are wondering why streaming local contents to Chromecast is so difficult, but streaming Youtube or Netflix to Chromecast is so easy. This is due to the nature of Chromecast. Chromecast has two working modes (see this post for detailed discussion). In web apps mode, it is simply a web browser. YouTube , HBO and many other internet streaming servers, send a web page to Chromecast with all media info, and Chromecast play it to your TV. So, Chromecast works nicely with internet streaming services (if the service provider supports Chromecast). But in tab casting mode, Chromecast uses WebRTC (Web Real-Time Communication). This technology is NOT suitable for video streaming, especially full HD videos. Both methods of streaming local media files mentioned above are using WebRTC. This is one of the reasons why the video quality is limited to 720p. To stream local media to Chromecast smoothly, it is better to let Chromecast work in web apps mode. This requires a media server (to serve contents) and a web app (to pass the content info to Chromecast). There are many media servers. Most of them are free. Some are even open-sourced. Because we need a media server AND a web app that supports Chromecast, the choice actually is very limited. Of course, if you check Play store, you can find some decent free apps that support local media streaming to Chromecast, e.g., BubbleUPnP. With Plex, the free Plex media server and the free web app (for PC) will solve both problems. Please note, Plex web app for PC is free, but the app for Android is not free. Anyway, as we intend to stream local media to Chromecast, it is not necessary to use Android app. What can be done? What are the requirements with Plex media server solution to stream local media to Chromecast? Before we start the setup, it is important to know what can be done and what the requirements are with this solution of streaming local media contents to Chromecast. You can stream videos, music and photos to Chromecast from a PC. You can also queue (with some twists) media contents to Chromecast. This essentially makes a playlist for you. Your PC must connected to internet, although we are just streaming local contents. Actually, Chromecast also requires this. 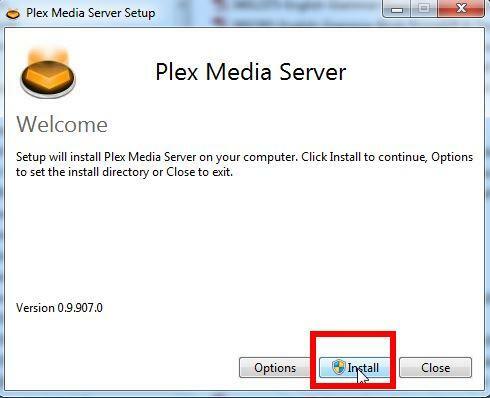 You must have administrator privileges to install the Plex media server on your PC. You need register a free Plex account to use web app. In this guide, I use Windows 7, It should work with other platforms, including some NAS servers. Step 1: Sign up a free Plex account. 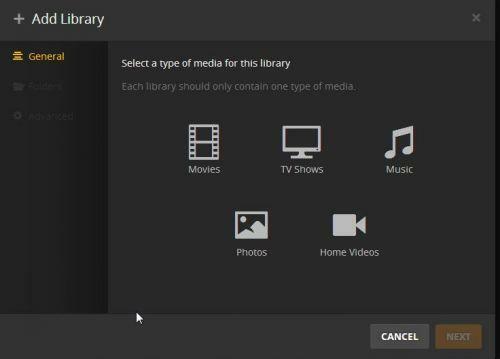 To use Plex media server to stream local media for Chromecast, you must have a Plex account. The good thing is that the account is free. You can go to http://plex.tv, click Sign up button ( https://plex.tv/users/sign_up )to finish the registration and activation. Write down your email and password for your Plex account. You will need them later. 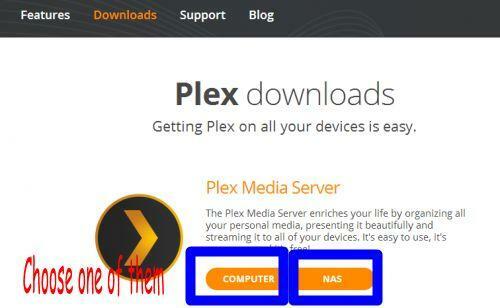 Go to https://plex.tv/downloads, choose the installed either for PC or for your NAS. The NAS support is limited to the following brands (not all models of these brands): Synology, Netgear, QNAP, unRAID, Drobo and ASUSTOR. In this tutorial, I will assume you are using a PC with Windows 7. For other OSes, Linux, Mac, and FreeBSD, the procedure is similar. Click “computer” to download the installer for PC. Then click Download English to get the installer. Once the download is finished, check the file size. For the English version, it should be more than 60MB. Double click the downloaded file Plex-Media-Server-0.9.907.429-f80a8d6-en-US.exe (the version number may be different for you if newer version is released). You should get a security warning as shown below. Now you should get the installation window as shown below. Click Install. You will very likely get a security warning on installation (user access control). You need click yes to proceed. After one or two minutes, the installation should finish without errors as shown below. 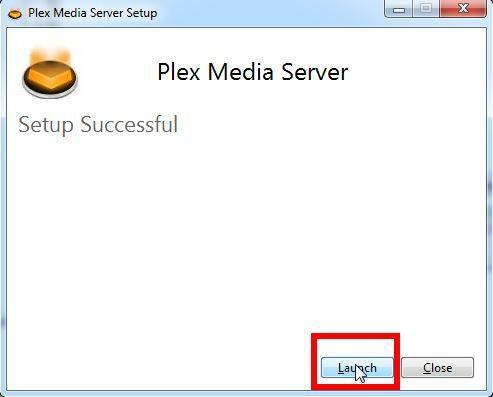 Once the Plex media server installation is finished, you can launch it immediately by clicking the Launch button. 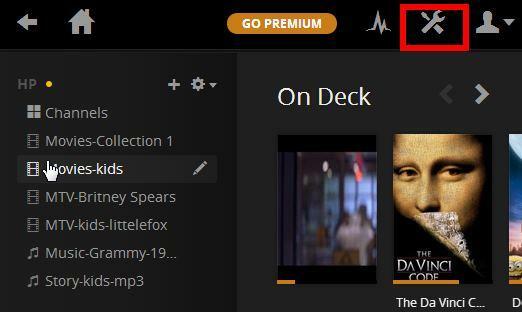 Once the Plex media server is launched, you should notice a Plex button in the notification area as shown below. 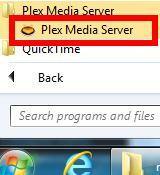 Alternatively, you can start the Plex media server from: Start–All Programs–Plex Media Server-Plex Media Server. 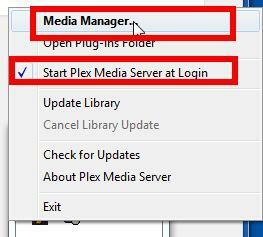 If you want to run Plex media server automatically, you should check ” Start Plex Media Server at Login”. Click “Media Manager”(as shown above). The local Plex web app will be started as shown below. Alternatively, you can type: http://127.0.0.1:32400/web/index.html in your browser to get the same page. Now you can add your videos, music and photos to the library so that you can stream such local contents to Chromecast later. Simple click the “+” button (as shown above) to add local media to the Plex media server library to be streamed to Chromecast. You need add contents to the library by media type: movies, TV shows, music, photos or home videos. Once the type is selected, you will select the folders. For example, I want to add some movies to my Movies-collection 1. I choose Movies, then type the collection/resource name (so that you know what they are) as shown below. Click Next button to select folders that have movies or videos. You need click Add folder to select a folder. Once the folder is selected, you can click Add folder if you want to add one more folder. Please note, it is not necessary to add all movies in one collection. You can always create more collections, or add folders to existing collections. Once you select all folders for this collection, you must then click Add Library as shown below. After you click Add library, you will be brought back to the the dashboard. You can click the “+” button to add more media files/resources to the library by repeating the procedure. Connect your local Plex media server to your Plex account. You need only do this once. Get a web app. Free web app tool is available for PC. Connect Chromecast to the same router of your PC. Once in local interface, click settings button as shown below. 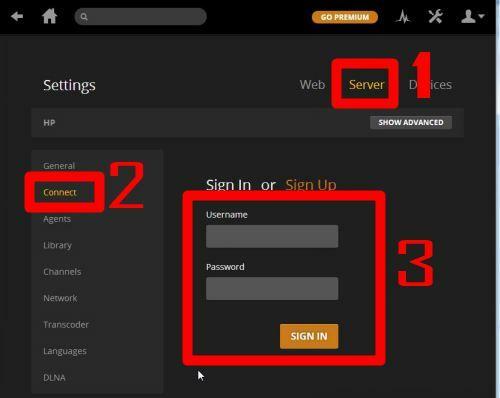 In the settings interface, click Server, click connect, and then login with your Plex account which you registered in step 1. Please refer to the screenshot below. It may take up to one or two minutes to connect your media server to your Plex account. You only do this ONCE. This step is extremely important. Failing to connect your local Plex media server to your Plex account will make it impossible to cast through Chromecast! If you cannot see this Signed in info, you should not proceed. You only need sign in once. In the future, it will sign in automatically. 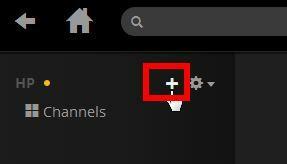 Now, you can go to https://plex.tv, click Sign in button in the top right. Once you signed in, you will see a Launch button as shown below. Now, you can right click the Chromecast icon, select one device if you have more than one Chromecast dongles in your home. Now you can play any local media files (videos, movies. music, photos) to Chromecast. This essentially streams local media to Chromecast from your PC. It works for almost all videos, music and photos. If you get any problems in using Plex media server to stream local media to Chromecast, please let us know in the comment box below. Basically, mobile devices are NOT needed if you want to stream local media files from your PC to Chromecast ( TV). Everything can be done in your PC. Sometimes, you may run Plex media server in your NAS server, and you don’t bother to boot the PC. Then you may want to use your Android or iOS devices to launch web app. Unfortunately, this does not work as you expected although you can launch the Plex web app. Chrome for Android or iOS does not have Google cast extension! You need Plex for Android or Plex for iOS app. Both will cost you $4.99. The app gives similar functions as what you get from your PC as far as streaming local media to Chromecast is concerned. So, the Plex app for Android or Plex app for iOS is not always needed unless you are too lazy to start your PC, or you need some other features in the Android or iOS app. Can I create playlist for Plex web app? No, at this time (May 2014) you cannot create a playlist for Plex web app. As shown in the following screenshot, you can create filters, or play all, or shuffle all to Chromecast. This actually is very similar to playlist. There is a queue function in Plex web app, but I cannot add local media to it. Why? The queue function is not for local media. It is for online videos, for example, YouTube. On Google Play Store for Chrome all you need to do is to download an app called “Videostream” which lets you easily stream local files of many many formats with, support for subtitles. 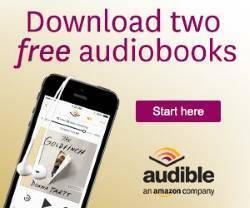 It’s free and yes – it works like a charm for me! Thank you for sharing the alternative method of streaming local media to Chromecast. Before finishing this post, I actually tested Videostream. To stream local media, videostream is simple to use because it is not necessary to setup a media server. It is implemented as Chrome app, so it is extremely easy to install it for the browser. 1). to stream music, you have to use playlist, which requires Premium upgrade ($14.99/year). 2). it does not support photos. At least, I did not figure it out. 3). it extends file format support (with some transcoding) for Chromecast device, but video format/codec support is still not as extensive as Plex. Some readers may not realize that Plex media server also has a DLNA server (it is enabled by default). This means Plex media server works with most of your devices in your home because most mobile device and smart TVs support DLNA. This is actually one of the reasons why I recommend a media server solution if you have many media files. Anyway, I agree that Videostream is an good alternative solution for streaming local videos. It works great (if the format/codec is supported), and most importantly, it is very simple to start. sorry to ask silly question. can I install Videostream on my windows 7 laptop? I was not able to install as it reported “You haven’t accessed the Google Play Store app (the white shopping bag icon) on your device with this email account.”. I think it is expecting me to have an Android device which I haven’t. You should NOT go to Play store, which is for Android devices. Thanks Simon for the advise. I’ll try what you suggested about Videostream. Yesterday I installed and configured Plex on my Windows 7. It was slightly complecated but the instractions are nice and clear. The Video plays fine and I am happy with it. However, when I play/cast my photos (using Plex) it dosn’t do Full Screen. When I select Full Screen the photos are slightly bigger but doesn’t display in full screen on the laptop or on TV. The photos I am using are hi res photos and should look good on TV. For the photo, it’s probably due to the aspect ratio. I will check whether there are any special settings for photos. I didn’t find any special settings related to your problem. You may check with PMS community to find whether other people experience similar issues. Yes, locally works, but when I select the chromecast and after I play the movie the note appear. Do you try testing using win8. My PC work with win8. For me, Plex works with both Windows 7 and Windows 8. You may try to go to local media manager, click Settings button–click Server tab, click connect, click sign out. Go to Plex.tv/web untill it cannot find your server. Then in your local media manager, sign in with your plex account for the server (the same location where you signed out). Wait a few mins, try Plex.tv/web again. I will try again in the future!! What did you get, or what are the errors? I’m experiencing the same issue. I can watch my videos from both local and external access, the problem occurs only when casting to Chromecast. I use an ADSL modem and an WiFi router, both forwarding port 32400 and McAfee firewall rule to allow port 32400 use. I can reach my 32400 port from external access and my PMS tells me that is fully connected, exactly like your screenshot. I’ve tried several times to shutdown every device and disconnect and reconnect my PMS to my Plex account. Chromecast keep showing the message “Unable to cast” “This media is currently unavailable”. I’m using Windows 8.1. Did you try to logout at Plex Web site, then log in again? Glad to know it works now. Sometimes the cache in the Plex server or on your PC may cause some issues. I tried Plex on Chromecast remotely with my Plex Media Server being in a different network location. Both my networks have good bandwidth 30Mbps download, 1Mbps upload. I experienced several issues with Plex, one being garbled sound on Chromecast for most of my files (Plex reproduced the issue but did not come up with a solution), and the second being image freeze / buffering every 10 second. I use the Synology DS Video Chromecast app instead. It is free but you need a Synology NAS for the media server. DS Video works like a charm out of the box and does not have the technical issues I just reported with Plex. So if you can afford a Synology NAS for your server, definitely use the DS Video app instead of Plex. Did you try the Plex server on your synology nas server? I am interested in casting my music on my labtop to my tv. I have Google Chromecast on the tv and am running Google chrome browser on my laptop. I have been using the Plex server software for a couple of months but I have run into numerous issues. The solutions offered on the Plex blogs are complex and often ineffective. I read somewhere that casting content from your local pc to chromecast is a more difficult process than streaming content directly from the internet. So, I just signed up for Google music (free service) which allows you to upload your music onto the cloud. Now I can stream my music to the TV using my account on Google music. So far, has worked well. Pricacy: Does Plex store any information? Since you’r requiered to login. Security: Is the Plex mediaserver safe as in only accessible for the local network? Use a cable to connect your NAS or PC that you’re streaming from, more bandwith and almost no latency. I’m not sure about the information Plex may save. For personal use,there should be no issues. It doesn’t ask for credit card info. As I know, the company has no bad records on this. Technically, when you connect to Internet, there are security issues. You may try to change the default server port to avoid some automated hacks. So far, there are no known security problem with the Plex media server. I’m unable to see the Chrome Cast button inside the Plex.TV website even though I’m logged in. Thoughts? Can you see the Chromecast service inside the chrome browser? Please note, you must use Chrome browser to access Plex.tv to use Chromecast. I have the same problem as “J V”. I have signed in into Plex and I have a server port number. Going to the web app I can click on Launch button but no Chromecast button for Plex, though I have the chromecast button for the Chrome tab. I have only one Windows 7 computer connected over ethernet to my router. Chromecast is connected on the same router via wifi of course. I can cast Chrome tabs but not Plex. I believe you already know the Chromecast icon only appears on http://plex.tv/web/, not on your local media manager. After you click launch in plex.tv wevsite, and log in, did you see your local media listed? If they are NOT listed, it means some services on your PC are blocking it. As I know, some remote desktop software, e.g., Samsung’s remote desktop may block Plex. If you have installed any remote desktop software, please try to disable them temporarily. If they are listed properly, but you cannot find the cast icon, you may check your Chrome browser settings: Settings–show advanced settings–content settings, under plug-ins, click manage exceptions, add [*. ]plex.tv to “Allow”. The restart your Chrome browser. If it does not work, you can try to remove Google cast extension, then add it again. I had it working. I followed step by step what you did and I now have the button. The difference I found is that it requested me to login while I was automatically logged in before ! I had horrible problems getting the button to show up. After trying everything on the web about this, what I think made the difference, was making sure i logged out of BOTH the server web console and the plex.tv console (different things! but very similar). look in the upper right corners of both for the user icon. I had the same problem as J V initially. It turned out that I needed to upgrade my Chrome browser to the latest version. The auto update wasn’t working in Windows 7 so I just downloaded and installed it manually. On restarting Chrome the Chrome Cast option/button appeared in the Plex.TV web app. I have had the same issues as the guys above with the cast button not appearing, i have tried update google chrome, logging out, update the plug ins, and stopped all/any remote log ins. do you have any other ideas? can you cast the Chrome tab? or does the problem only happens to Plex web app? can you send the chrome tab to the TV? If yes, after logging in plex Web app, reload (refresh) the page. You may need wait a few seconds to see the icon. You may also try to manually clear the cache for chrome browser. Before the problem is solved, you can try videostream extension to see whether it works and to enjoy the video first. As I see that streaming is possible only with https://plex.tv, does that mean that running local media files on TV via chromecast will eat up my bandwidth? I have a limited internet connection. What if I keep the wifi router running and switch-off the internet? Will I still be able to stream? Also how do I control the media being played on TV. My TV is on the first floor, where-as the PC is on 3rd. Would I be able to choose the media on TV or will I have to climb up everytime I need to see a new movie? First, Chromecast requires Internet connection even you just use it for local streaming or just local desktop mirroring. I’m not sure about the reason. Yes, for Plex media server to Chromecast, you need Internet connection. It will consume some data, but not too much. The media files are transmitted locally, not through the Internet. You cannot control the Plex web app from your TV. But you can do it from any laptop, pc, Android phones or tablets, iPhone or iPad. Only apps for pc ( same for laptop) are free. Plex for Android or ios will cost you $4.99. Amazon app store (for Android) often offers it at $0.99. The answer is easy. All you need are 3 things. Android phone or tablet. Chrome cast and any dnla server. If using windows 7 enable media streaming in win media player and step one is done. Step two download allcast from clockworkmods from play store on android device. Three open all cast and select Chromecast after setup and choose TV media server and it will find your PC on a local network and will cast to your Chromecast or appletv or roku with zero trouble and no lag full 720 or 1080. With out browser or other modifications. Chromecast SDK does wonders for making apps. Simple google searches work. I have just installed the Plex Media Server on my MacBook Pro running OS X 10.9.3 and I have the latest Google Chrome 35.0.1916.114. I also have a Chromecast that is setup and connected to my network. Plex has been setup exactly as stated in this guide, both local and plex.tv/web are connected to my Plex account and both state that “Server is mapped to port 32400”. Yet when I use plex.tv/web, I get the message – This media is currently unavailable. Problem 1: This applies to anything that I attempt to cast, including Plex’s apps such as Apple Trailers. It doesn’t matter what I choose from anywhere. Problem 2: All media plays locally and also plays in plex.tv/web before clicking on the cast button. Problem 3: No firewall, router, anti-virus or anything else blocking the connection. I have tried your method of signing out of both, waiting, and systematically signing back in again. But that didn’t work. Is there anything else that I could try? Or is there something I’m missing? You may sign out of Plex.tv, clear your browser’s cache. Then try again. Anyway, for me, when I got similar message, signing out (and signing in again in Plex.tv ) is always sufficient for me. I have signed out of both, cleared my cache and that made it worse. 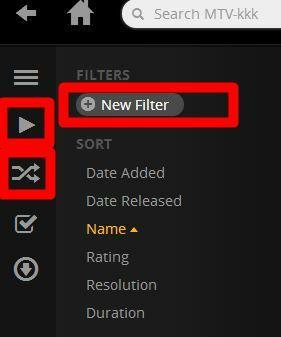 Now the cast button/option has disappeared from plex.tv/web. Sometimes, after clearing the cache, the detection of Chromecast is not so fast. You need check whether the browser can detect the device. If yes, close the browse, try again or you can just reload the page. Hello again Simon. Based on your advice in a separate post, I borrowed a Chromecast from a friend to test it out. My objective is to play local media on all my televisions. The cheapest solution is to connect a Chromecast to all. First, Chromecast with Youtube worked like a charm. Video and Audio was synchronized. Sound quality super. Now, when I tried streaming files through the Chrome browser by inputting the local address, Video was a little choppy. Sound was about 1 seconds behind. Was not a good experience at all. So I went ahead and downloaded Plex and followed your Guide. Everything worked well, till Step 6 in your Guide – I clicked on Server. Then clicked on Connect. Signed in normally. It showed me that I had successfully Signed In. But it showed me that a Port number could not be found. It asked me to switch to Manual Mode to manually assign a Port number. That sounds completely alien to me. I am not sure where to find Port numbers from. Q1: Can you please help? Q2: When I play local content using the Plex + Chromecast combination – is all the actual content being transferred over the internet? Or simply via my local network? Q1; it is probably related to router/firewall settings. Q2. The actual content is through local network only. But you need internet connection. Actually Chromecast also requires internet connection even when you cast local blank Chrome tab. Hi Simon, I don’t have the chromecast icon when logged in plex.tv/web. I tried everything suggested here. Adding the plex.tv to exceptions, logging out and in, checked that both chrome and plex are up to date, cleared chrome’s cache – not sure how to clear plex’s cache. I am actually able to stream the tab plex.tv tab when playing a movie to the chromecast. Clearing Chrome’s cache usually is sufficient. For me, I encountered this a few times. But every time, logging out of the website of Plex.tv is sufficient. I have no clue if this happens often. Maybe, you check the Plex community. This advice from Radek instantly helped me stream to my Chromecast. You are the most motherf*cking awesome person to have ever lived, besides me. (1) Like many here, I’ve had issues with the cast icon appearing intermittently. (2) You mention that it is not necessary to use Android app, which is true. However, I find sitting in front of the TV with my laptop nearby is cumbersome (we are 5 sharing the couch!). As I did not want to buy the Android plex app, I found a solution to solve both these issues. I now use BubbleUPnP on my Android phone & tablet, which through DLNA will access the Plex Server. So for me the best combination (for free) is: Plex media server + BubbleUPnP + keep my laptop open. Works on both my Chromecast and WDTD Live, and I can access & control all my home library through my phone/tablet. Great! Thank you for sharing the valuable info. The only drawback is that some formats may be not supported by BubbleUPnP (due to Chromecast limitations) because it does not do trans-coding. Firstly, thank you for taking the time to put together a great piece of information. After a bit of messing about, I have now got this working just nicely, and for the first time have a good solution to the playing of 1080p (large) *.m2ts video files across my home network, without having to plug a laptop into the TV.! Brilliant. Same issue as above with regards to not being able to get photos “large” on screen, but I can live with that. One thing I can’t quite work out is how to use the queue on home videos. There’s a “play all” against a whole folder. And there’s a bulk select tool within a folder. But there’s not the ability to queue specific files, or play just those selected in a bulk select – that I can find at least. The queue seems to be for adding things found online. Do you know if that is possible.? As I know, the playlist feature is still not available for Plex. As you already know the workaround is using filter, although not flexible. Hopefully, the developer will add this feature in future releases. Yes, the queue in Plex is for online contents, not local contents. Regarding the viewing of photos on full screen, having now bought the android app – playing the photos via that to the TV will put them on screen at “full screen”. Coupled with being able to then use your smartphone as a remote control for the media server (mine is in a different room), this makes it £2.98 very well spent. I’m using a Ubuntu based server wich has Plex media server on it. I followed your guide and everything went swell until after the ”click launch button” part. My server doesn’t seem to detect the chromecast automatically. What can I do? If the Chrome browser can detect the device, but the web app fails to detect it, you can try to reload (refresh) the web app age. First, you need check whether you can cast your chrome tab. Did you find the chromecast name in Google cast extension on your browser? After you can cast a tab, reload the web app. Thank you for your help. This is an amazing feature. It means you need connect your local plex media server to your plex account. This is done under server settings as shown in the guide. I followed all the instructions and just can’t get the chromecast icon to show up when they say it should. Part of the problem is that no matter what I do the plex website says it can’t see my local media server when I connect. I’ve manually specified port 32400, port forwarded it in my router (Asus rt-N66u) and no go. By default, for most routers, you even do not need set the port forwarding. But anyway, you have two problems to be solved: 1). the Choromecast was not detected. You need check whether the Google cast extension can find your Chromecast; 2). the Plex web app cannot locate your Plex media server. This can be complicated. 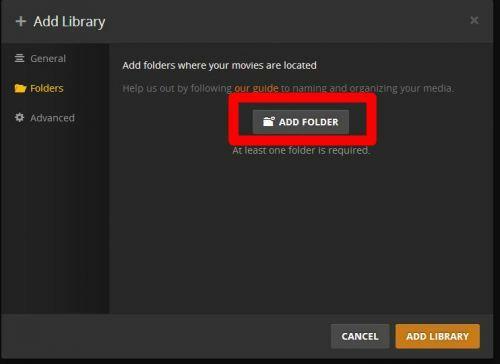 Normally, you don’t need any special settings because the access is initiated by your Plex server when you log in with your Plex account (just like accessing a website from your browser). I’m having a similar issue as Jose. I am running Mac OS 10.9.4 and the most current version of Chrome. I followed the setup instructions here and I got Plex and ChromeCast to work! I uploaded a few videos and tested the different file formats and everything worked 100%. HOWEVER, then I restarted my computer. Now when I attempt to launch plex.tv/web and provide my login information, I get an error that says Erin’s Macbook Pro “We’re sorry but we can’t reach this server.” This may sound like a stupid problem, but I’m a bit of a novice and can’t figure out how to reconnect to the server. Did you check whether the local plex server is connected to plex? When I log into Plex.tv/web, under Settings –> Devices –> Server, I see the Plex Media Server that I set up perviously, but I can’t connect to it. When I go to my user account and select servers, I see the server that I set up, but when I click on it to connect, it says unavailable. I have a feeling it’s not able to connect to the IP address. 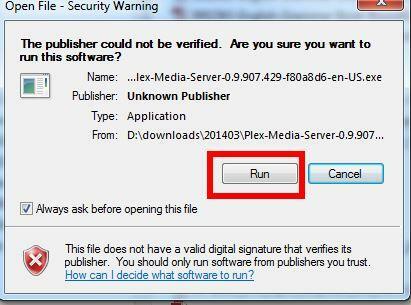 It means you the plex media server is not started on your pc. You need start it first. Then you can manage it. You can set it to start when you start your system. This is actually the default setting for Windows. You can enable this after the plex server is running, as shown in the guide. Is the Google Cast extension required BTW? Also, does it matter if, when I connect the local plex media server to the plex account, it informs me that it connects, but can’t access it from outside my network? Yes, you must add the extension to your Chrome browser. Before checking whether it works in Plex web app, you need check whether the Chromecast device is properly detected by the browser. For the plex media server, it is supposed to be used in your local network. But Plex need a web app to stream media to Chromecast. So, the web app need locate the server. First, thanks a lot for the guides! Using Videostream from laptop is perfect. Awesome quality on tv. I built up the Plex server, and the streaming is very sloppy (impossible to watch). Laptop’s cpu is 100%, so I figure out it’s a matter of the trans-coding consuming too much cpu. Do you know what are the minimum specs? I own a Dell XPS m1530, with Intel RED CORE 2 DUO T9300 2.50GHz,800,6M ; 4GB DDR2 SDRAM (667MHz), nVIDIA Geforce 8600M GT with 256 MB GDDR3. Windows 7. Is it enough? The laptop should be sufficient for a plex media server. Plex can run smoothly on many NAS box with lower specifications. Did you test different video format? Yes. From top quality to 320 kbps. Hmmm, re-reading your question, do you refer to test with other videos with different formats? Here the answer is no. I’ll try. In my first answer above, I was referring to the fact that Plex lets me choose the output trans-coding quality when streaming a local video. Any output I choose, cpu is always 100%. Do you know if is it possible to deactivate trans-coding? Trans-coding is only needed for unsupported formats (Chromecast only supports limited video formats). You may try to check Direct play and direct streaming. For me, I just used the default settings. There are no issues with CPU usage. I think you already know you need clock “show advanced” to see all options for the server and web. I tried turning on and off the following things in Config/Web/Player: Experimental Player, Direct Play and Direct Stream. In Config/Server/Transcoder I tried Automatic and Prefer Higher Speed Encoding. If I’m only watching the videos (now I tried several) on the computer, without using Chromecast, CPU is still 100% but works fine. Video is not sloppy and sound is ok. If I activate Chromecast to watch it on TV (the same videos, including on-line channels like Apple Movie Trailers), no matter which options I switch on or off, video is sloppy and sound is ok. I don’t know what else could I do. If you have any other ideas, please tell me. If I cannot work this out, I’ll have to use Videostream which works fine, but I’d miss the awesome potential of the Plex Media Server. If the cpu usage is 100% when watching the video on your laptop, the laptop maybe overloaded and plex server may not get sufficient resources. I’m afraid I didn’t explained well. I meant playing videos through Plex, CPU is 90-100% (40-70% the Plex Transcoder + 20-40% Chrome tab with Plex, I believe). If I watch the same videos by means of VLC (without Plex), no problem. CPU usage is normal. Not sure about the causes. You may check with plex media server developers to find out the causes. It could be due to some settings on your pc and/or some settings on the pms server. Of course, if you changed a lot in the plex media server, you can try to reset them to default to see whether it’s better. Hello Simon, wondering if you can give me some insight on my issue. I recently purchased the Google chrome cast. I setup plex with the general instructions with no issues. I added a few movies local on my machine. I am able to play the files locally on my machine and externally from many different places with no issues on laptops, desktops and my Samsung S4 with no issues. When I play the files for the chrome cast to my TV there’s lag for about 1 second every 5 second or so from any device, laptop, mobile device or tablet. The router I am using is dual band and brand new. Chrome cast works with Youtube, crackle and many more applications. Issue is only when using plex. I tried the web browser and cell phone and tablet. CPU when streaming is never more then 15% always have more then 12 gigs ram free but will always lag and not sure why. Any setting that I can try that may help? most time, Plex media server works out of box with the default settings. You may try to check Direct play and direct streaming (settings–web–player, you need click Show advanced). Also, in settings-server–network, enable GDP (you also need check show advanced). Hi Simon, everything works for me except subtitles, how it works? I had a bad experience with Plex and Chromecast. After one weekend trying Plex and some crashes at the Plex Server, my computer went down and I had to recover the windows with an external disk. I had a hard day to recover it. I run a HP Envy 4 laptop with Windows 8. It casted well youtube movies and I tryed to install plex in order to cast some movies from my pc and from a NAS attached to my home netword. All the time I tried to open plex Chrome went freeze and I was obliged to restart my pc, After one restart I got my crashed boot section and I had to create a flash boot to recovery it. I guess such problems are no only due to Plex and Chromecast, but Plex lack of stability was somewhat frustrating for me. You may contact Plex media server developers and I personally seldom heard about such a big problem caused by the software. The most common problem is that it does not work with the web app. Plex just announced that they now allow playlists. Perhaps it is worth updating this post, especially the spots where you mention it was not available? Thank you for the info. Actually, I’m testing this features now. Yes, I will update this post with the new feature and its usage. I had the same problem trying to make the chromecast icon show up. so I reconnect again then I could see the icon. if i want to share my plex library with my parent (out of lan) using a chromecast in your tv what can i do? 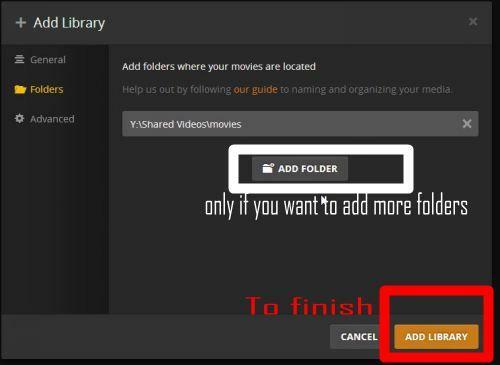 Technically (there may be some network/configuration problems here and there), it should work as long as you share the videos with them or give them your Plex account. Please note, this requires substantial bandwidth for videos. You can always test it first. First, make sure you can access your media out of your lan (e.g., from your mobile phone using mobile data). In other works, the web app or Android plex app will check whether the Chromecast in the same wifi network. The server can be in a different network as long as it is accessible. But bear in mind, some ISP settings may block some fucntions. I managed to get to step 7: Launch Plex Web application, but then after the login and press Launch (BTW, I need to login before I press Launch) I don’t see the Chromecast Icon where it was supposed to be. I only see the icon at the top of chrome, near the menu button. Can someone help me on how to see the icon and be able to stream? You also need make sure you can cast the chrome tab. If you click the casting icon, does it show your Chromecast device? The icon appeared after some time. In general everything is running now. The only problem that is left is that video casting is halting for 3-8 seconds in the middle of the casts, many times, and I don’t know if the problem is my computer’s processor (a dual-core 2.20 CPU) which is too old or my network (802.11g) which is giving it around 15Mbps which is too slow. For the setup, you probably can only handle 720p video, not 1080p. In addition, the ram (memory) is also very important. Actually it’s more important than cpu. Did you try a video with lower resolutions? Yes, lower resolutions are fine. I have been searching Plex forums all the morning, and came to the fact that when transcoding those videos, my Logfiles show speed of 0.1….. this means I need a new computer. Thank you for the update. Your network connection can also be an issue for 1080p videos. Normally, you should get 30-54mbps from a 802.11g connection. Maybe your pc is to far from the router. Anyway, when getting a new pc, getting more ram is very important. Hi Simon – Easy question I’m guessing…We own a Mac and I installed Plex on it. We are viewing it through our Roku3 and are basically using it to stream tv shows from the various websites. After a short time, we tried it agian last night and it said that our free trial had expired and it no longer let us stream anything. Am I missing something? I didn’t think I had to buy the Premium Pass just to stream tv shows. Is there something I don’t know about or do I really need the Pass? Thanks!! I think it’s free only for streaming local media files. Hello i tried to connect my chromecast te the plex but it wont word, i connected the chromecast with my wireless and my plex server is running on a w7 desktop. that i plugged into the router. At what step did you get the problem? Can you run the server? 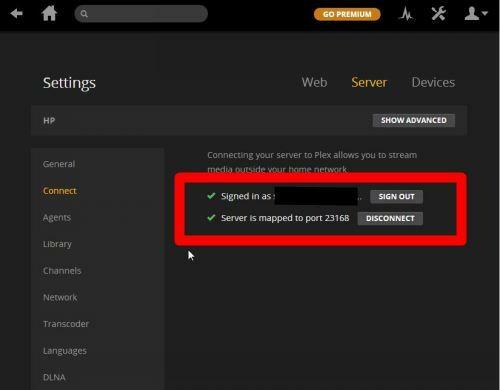 Can you connect your Plex server with your Plex account? Have read all the comments above but I’m a beginner so I need to addres a stupid question. My dauther want’s to get a function where she can use her laptop as a DVD-player and see it on her TV. Will this be working if I succed to follow your instuctions? I have not yet bought my Chromecast, I first need to know I will get this function? If you are playing real DVD “discs”, a DVD player is the best option. If you are playing media files (audio, video, photos), not “discs”, from the laptop and watch on TV, Chromecast is a good option. Please note Chromecast requires a WiFi router with active internet connection. Thank you for the article, Simon! This is incredibly useful for me and I got it working within 30 minutes. One question though: is it possible to pause the movie using one of the Plex apps? It would be very handy to be able to select and pause videos from where my television is rather than having to walk to my computer. You need the plex app for Android or for IOS. But they are not free. Amazon app store often offers the android one at $0.99, or free occasionally. If the chrome cast button doesn’t show in plex app try to disable “experimental player” in player settings. Thanks Simon for probably the best instructions I have ever seen, for anything! I have been using Videostream for ages, fine when it works (if a bit limited), but it is too temperemental. AllCast is OK for some things but, again, a bit hit and miss. So far Plex seems to best way to cast video, pictures, musci, TV, all in one place. Do you have a regular blog on other topics, I’d like to read more of your work! When I plays video through Plex my video twitching. Can anyone tell me what is going on? Any advice for solving this problem? If you don’t cast, and just play in Chrome browser from your Plex web app, will you get any problems? What’s the video format? is it saved on the same machine as Plex media server? Simon – yes, you can play videos on your computer (Plex or whatever) and cast your entire desktop, but it can be slow and buffer, so is not the best solution. If you are using Plex web app, you don’t cast the desktop. The web app directs video directly to Chromecast. If PC running Plex media server is not so old and the media files are located locally on that machine, normally the only bottleneck is network connection speed. You may try some 720p or 480p videos. This may be an extremely novice question but I can not find the answer anywhere. Is there a way from to use the plex app to cast files that are stored on my phone without having to transfer them to my laptop and add them to the server? It is impractical. The Plex server need access the media files directly (e.g., NAS, NFS…). It is hard to run a file server on a phone to share a file to a PC. Even, you manage to set it up, the slow access speed will ruin your experience. If the file is on the phone, you can use an Android to play it to Chromecast. Could you tell how fast is the internet connection have to be, because my internet speed is under 1Mb/s. Thank you! If you are using Plex for local media, the bandwidth (speed) does not matter as long as you can log in to Plex account. Will this method of Casting local media with Plex + Chrome cast use the Internet service providers data plan or is it only for the purpose of registering the plex server. I use Win 7 desktop PC and I have a WiFi dongle installed in it, can I use this setup without using internet service provider to cast local media. The streaming is through local router. But you need access the plex web app to stream. Also chromecast requires internet connections. Chromecast also must connect to a physical router. Otherwise, you cannot finish the setup and cannot stream. The advice to get me up and running smoothly using Plex server on this site was great. Worked like a charm! Any snags I came up against were explained perfectly in your articles. I wasn’t going to purchase Chromecast unless I had an easy ability to stream my local media and Plex server solved that very well. Thanks! Thank you for such an amazing post. Especially the great lengths you’ve gone to make it clear to the dumbest (excuse me for the term) of us. 1. I’m not able to finish download of the plex PC/Windows application. Howsoever I try, it stops at around 5 to 6% (of around 85 MBs). Otherwise my BBand plan is good and gives downloading speed of around 500 kB. 2. In Google chrome, after I run Video Stream extension, it reports some minor problem like firewall and asks me to download a simple network troubleshoot.exe file. But that download never starts. I’ve tried different browsers and all say “Page Cannot be displayed”. Glad to know the post is helpful. For the downloading, usually it is not so reliable through browser. You can try to download with some download manager, e.g., Free download Manager (http://www.freedownloadmanager.org/), which can manage and resume your downloads. For the firewall issues, it depends on your PC settings. Most users do not have any issues. For me, I use the default windows firewall + Avast free anti virus, and I never get any warnings or errors. I am not sure about the download. BTW, can you cast a Chrome tab? I am unable to use plex on different router than the server or on mobile data. Can anyone help me with this. By the way I am using plex free version. You’d better provide details of your setup, what you want to do, and detailed info of the error message. My installation on a Win 7 64-bit system went just fine and I can cast files to my TV ok. However – I am having a problem getting local files recognized and loaded into the Plex libraries. Many media files are simply not recognized. These are mostly older TV videos. I have tried making the naming conventions match the recommended format but still no luck. I am using the Personal Media Shows agent for the search since all I need is a simple file name in order to identify the files. Is there a way to tell Plex to just use the directory names and not try to figure out the details? For file formats, you may have to use some tools to convert them. 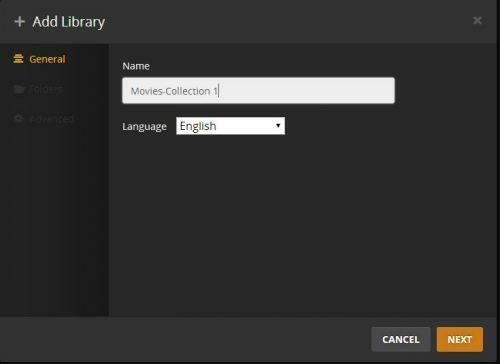 Plex media server replies on metadata and collections to organize your library. If you want to manage the library in your way, you need add the folders manually and assign them to different collections. I am not sure about other ways. Hi, I would just like to say THANKS! 🙂 This works absolutely seamlessly and was easy to setup when following your guide. I’ve been battling DLNA servers for a long time, the samsung play device server is not good and has given me more headaches than happiness. 🙂 This investment in the google chromecast combined with Plex server is just brilliant. Easy to use and it looks good as well! Again thanks! And for me this was just a plug and play – follow the instructions. Win 7 on laptop – works as a charm. Hello, and thanks for this great guide! Unfortunately, I couldn’t see neither the CONNECT tab, nor the “Server is mapped to ….” message. Instead of CONNECT, it says “Remote Access”. I think that is probably due to some changes in the new version. But the principal should be idential: you need connect your Plex server to your Plex account. I will try to test the latest version of Plex media server in the next a few days. Yes, Plex can be used to stream both local music and videos. I’ve set up Plex and streaming from my laptop’s music works via Plex. However, Plex is continuously ‘downloading metadata’ for my music files. Did I do sth wrong? What needs to be done to stop downloading metadat all the time or is it normal that it takes more than 1n hour for +- 4000 mp3s? It’s better to let the plex server to finish the downloading. It can take a few hours. When streaming movies to the TV, how can I keep the sound on the PC?. I do not want to use the speakers from the TV but to connect the PC to my stereo device to get a better sound. As far as |I could see Chromecast turns off the sound on the PC as soon the casting starts.Is there a solution available? No solutions for this. You cannot split sound and video when using videostream. Sad. Anyhow, thanks for the rapid answer. Many thanks for making things so easy for a layperson to get their Chromecast 2 working. The instructions and screen shots were absolute gold and easy to follow. Thank you for your feedback. Enjoy casting. I just purchased an Amazon fire tablet and followed the instructions to install show box and all of the components necessary to do all of this. it works just fine for me but what i am seeing is that when the video is playing on the fire it is crystal clear but when i go to cast the video to my google cast the video play is very poor on the tv. It is like the video is all pixels, its not horrible but it is not good either. I also have show box downloaded on my phone and it is excellent quality when played on the same tv.. I was really hoping this would work well since i like show box and it seems to be a cheap way to watch movies but the quality is just not there. Any advise on how to fix this issue? Are you using Plex? It is a bit confusing what you are doing.